RNC? Oh yeah–the guys who put McCain for President in 2008 and Mit “Weak Sister” Rominnie against the yellow prince in 2012/ Oh yeah, THAT RNC. Wonder which castrated, back stabbing mama’s boy they’ll run in 2016? Christie sings soprano, doesn’t he? I sent $100 to the RNC Rominnie campaign because he said he needed help to win PA. What an idiot (I was.) Not another nickle, not a farthing not a sou. Nothing for the Republicans– Everything for the Republic! Silly ad GOP. No punchline. Why don’t you consult someone like Sara Palin to spruce up your ads. That one is a dud. Agreed, it fell flat. They could have used some better clips of just Obama and Reid saying how bad raising the debt ceiling is, even unpatriotic. It was too disjointed. They should take their own advice. Nice message, but the progressives in the GOP can stick it if they think I’ll ever donate a wooden nickle to their demented party, ever. They need to make the dates stand out more. They’re drinking on OUR dollar! I just spent $175.00 at the grocery store…..that’s just for 2 people!! I need my dollar back. Lol, just give me one more drink. This thing is a complete mess. Only an insider would understand it. We have to get off our asses and stop marketing to those in the know and start spending all of our time, energy, creativity and money on marketing to the numb nut LIV. Exactly. Why waste money preaching to the choir? It really doesn’t matter when they rig the votes for Senate and President. Start there. Then you can get back control of education and the media. None of that matters until you break the vote rigging machine. Yet the GOP did raise it. So what? Typical DC antics, the script can be passed from dems to GOPe as needed….yada, yada, yada! The LSM are in the position to decide on the spin cycle for the public. Time to show the RNC a third option………grassroots American conservatives in DC representing US……..what a concept. The sad part about the video is that this footage all occurred when the Repubs were in control. I swear, that golfing picture of Obama is just hilarious. The yes-men following the Preezy couldn’t even handle that gaffe. Now create one that has Obama now vs. Obama then. No need to bring in the other clowns. With all… ALL… A L L… that the RNC has observed these past few weeks and STILL the RNC can so flub an ad that does not even quote Senator Obama his-self! It has been done. Over and over. This is more effective as it shows many opposing Obama who are Democrats. I agree. Let’s hear what Barry had to say. The left always say that we lie unless we provide video proof. Then they say we doctored the video proof and we need proof of our proof. I was just agreeing with you, lol. Naah! Their newest cry-baby whine is that they demand the unedited tapes. James O’Keefe will be happy to comply… I might add. Wonder if it will be on the MSM?? People need to see this. Nice. But I want to see a whole lot more and national T.V. commercials over this. This is cute and light-hearted… I want something deadly serious and stronger to be put out on all networks. The Republicans have the high ground in many areas here and they need to tell America why only they are fighting the good fight… and why. Keep ’em coming… and make them many and VERY public. Keep exposing the lies of Obama and his cronies. Spot on! The GOP should be buying up airtime and playing the Imposter’s words against the reality of what he does CONSTANTLY! Don’t let up…hit him hard and keep on hitting until every low info idiot gets the picture that this is not a man who gives a damn about them! It’s all about his cronies and keeping the power he wields unwisely. But it seems like most of the money in GOP politics is controlled by the GOP establishment. They support tax and spend they love tax and spend and really have no problem passing a clean bill. Do you hear Karl Rove championing the shut down? They will push to pass a clean bill because they are RINOs, liberals in elephant’s clothing, and they only care about themselves. Also, they often employ corrupt bastages like the Karl Roves of the world as advisors… Rove is only a friend to the establishment and himself. He needs to go away. All of these guys are traitors to this country. Well, guess what? My Cutie Beauty found that incredible speech which Tom Coburn made on the Senate Floor yesterday which made me want to hoist him up on my shoulders and gallop around the Senate Chamber. It’s over 20 minutes long. Please watch it when you get a chance. Yes, it’s that good. This is a Great speech or really more like a set down at the kitchen talk, I’m listening now to his speech, I hope everyone will listen to the entire speech its well worth the time. The senator seems like a very good man who is concerned about Americans. Love the credit card scene (-: …. forget the scissors lets just tear up the credit card. Excellent! and much more. Just so you know about half way through I had to pause and make the call to his office to thank him. Thanks Rshill7…Great speech from Coburn. Hell… why doesn’t he go for the gusto… go for the effect and combine all the net assets of Canada’s federal government, our provinces and our people on top of his list… He’d still not have enough to cover the unfunded liabilities. AND they are truthful – what more can you ask for! There must be some kind of obscure difference between a Republican debt ceiling and a Democrat debt ceiling. I’m sure the LameStream would explain to us that a Republican debt ceiling is evil and steals from the pockets of poor, starving people, while the Democrat debt ceiling is good, honest and is there to help the poor, starving people have enough to get by on so that they don’t succumb to the evil, divisive, terroristic Tea Party types in the government. It’s that simple, don’tcha know. Multi-LOLZ! Especially Mr Rangel’s remark at the end. LOL, I was thinking the same thing, Rangel’s remark is priceless! Rangel speaks from experience (what he can remember, that is). Send it to the RNC!!! It would have been more effective with Senator Obama contradicting President Obama. Why didn’t they do this? It was the first thing I thought of when I started watching. I know, right? They need the TRS commenters to consult on future ads. In reality anyone with a functioning brain that isn’t connected to the party would have been glad to explain it to them but instead they look to Karl “butthead” Rove. Because there is no video of Obama saying it. Because he never said it. He wrote it and submitted it into the record “as spoken”. He knew that someday a video could be used against him. The only thing they can do is show the text he wrote, there is no video of him actually saying it. 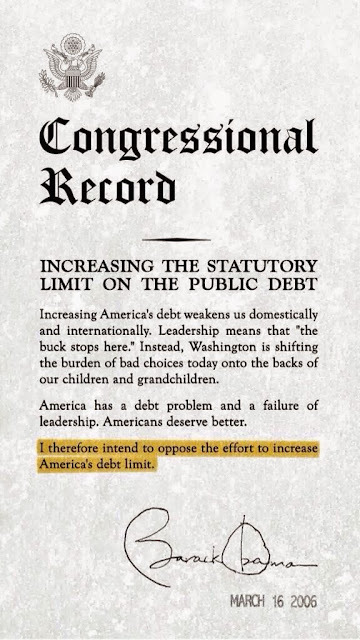 Yes there is video of Obama in 2007 voting against the Debt Ceiling. There have been several videos of Obama vs Obama including this. Some just on this. This is very effective. Obama and Carney have addressed Obama’s flip flop. Obama has no credibility. Some of the rest of these do. Do you have a link? Because I just read an article written by someone who was going to use the video. They were told by CSPAN that there is no video because Obama submitted his remarks in text form. I tried to find the article for you but I couldn’t locate it. Video of him admiting he voted against it but explaining why it is now OK for him to raise the debt. Probably what I saw was his 2006 text superimposed over his current statements. Google makes it impossible to research Obama they eliminate or false reference everything that could possibly harm him. I have heard it several times. It’s been on the radio. Either Hannity or Rush has it.